LÜNEBURG, Germany — In what is likely to be among the last chances to bring justice for the Holocaust, a German court convicted a 94-year-old former SS soldier of colluding in mass murder, and delivered an unstinting depiction both of the horrors of Auschwitz and the depths of German guilt. The former soldier, Oskar Gröning, was sentenced on Wednesday to four years in jail for complicity in the murder of 300,000 Hungarian Jews who were brought to the Nazis’ grimmest death camp in the summer of 1944. In a sweeping 75-minute speech, Judge Franz Kompisch presented what amounted to a reckoning with decades of German justice and the failure to prosecute thousands of perpetrators. The judge made it plain that every German had a choice about how far to go along with the Nazis. LÜNEBURG, Germany — Seven decades after the liberation of Auschwitz, a 93-year-old former SS member at the Nazi death camp shuffled into a German court on Tuesday to answer charges of complicity in the murders of 300,000 mostly Hungarian Jews in two months during the summer of 1944. With Holocaust survivors looking on, the former SS soldier, Oskar Gröning, certainly one of the last Nazis called to account, read a chilling but clear account of his life. It focused on the autumn of 1942 to the autumn of 1944, when he served in the SS at Auschwitz-Birkenau. The tardiness of the case against Mr. Gröning, a widower who lives in this small town in northern Germany, did nothing to reduce the tension in the makeshift courtroom, normally an assembly hall. He and his accusers can expect to spend much of the next three months here, measuring the march of 20th-century history through the lives of Nazis and their victims. Unlike those tried decades ago, Mr. Gröning does not deny that he was at Auschwitz and that he saw terrible things. The case turns on whether he is not only morally but also criminally responsible for what happened there. After the state prosecutor, Jens Lehmann, read the charges, Mr. Gröning spoke for an hour, then turned to Judge Franz Kompisch and said: “It is beyond question that I am morally complicit. This moral guilt I acknowledge here, before the victims, with regret and humility.” He asked for forgiveness. His words riveted dozens of journalists, spectators, relatives of victims and some of the 65 plaintiffs who have joined state prosecutors in the case. After a break for lunch, the judge spent an hour questioning Mr. Gröning, who took his listeners back through decades to the rise and fall of Adolf Hitler. Mr. Gröning said he had been a bank accountant who was conscripted in the fall of 1940 and volunteered for the SS because it seemed “always to be out front” and came back “covered in glory” from the swift Nazi successes in Poland and France, sealing Hitler’s grip on Europe. The defendant, who was lucid almost throughout, said his first doubts about Hitler arose with the invasion of the Soviet Union in the summer of 1941, which Mr. Gröning said he considered unwise, given Russian tenacity and might. 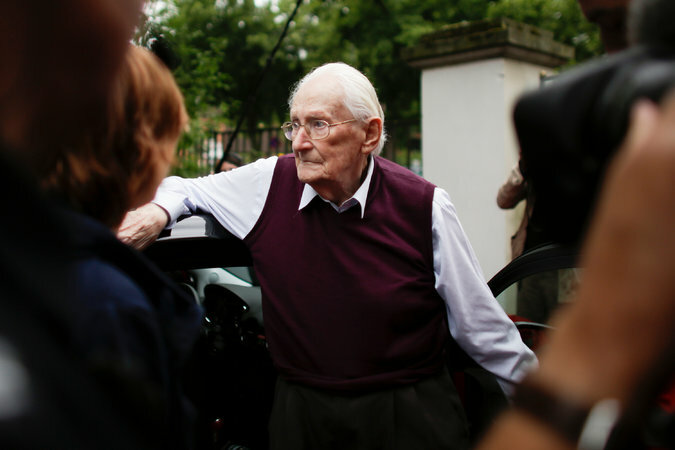 He said that he was responsible for collecting cash belonging to arriving prisoners at Auschwitz, as state prosecutors have charged, but that he also witnessed atrocities. He suggested that his doubts grew almost immediately upon his arrival at Auschwitz, when drunken guards talked of “getting rid of” prisoners. The atrocities he witnessed, he said, included one night in December 1942 when he was roused from bed to help hunt down fleeing prisoners. In the process, he told the court, he saw prisoners herded into a farmhouse and an SS superior tip gas out of a can into an opening. The screams of the prisoners inside “grew louder and more desperate, and after a short time became quieter and then stopped completely,” Mr. Gröning said. Reading his account with occasional guidance from his two lawyers, Mr. Gröning recalled minute details of his life in the SS, down to the imposing marble and wood carving in the hall where he and his comrades learned of their assignment to Auschwitz. It was presented, he said, as “a duty that will demand more from you than the front” and that had to be kept secret, even from family, but that was vital “to achieving the Final Solution” of eliminating Jews. In November 1942, he recalled, a crying baby was found amid trash discarded by arriving prisoners. The baby’s mother had evidently abandoned it in hopes that she would then be chosen for a work crew and not sent to the gas chamber. A fellow SS member, angered by the cries, beat the infant to death, Mr. Gröning said, adding that he complained to a superior but that no action was taken. The recollections of both the gassing and the dead baby figured prominently in the two lengthy interviews Mr. Gröning gave a decade ago to the BBC and the newsmagazine Der Spiegel. The events notably occurred outside the period in 1944 for which he is being prosecuted. Mr. Gröning’s case not only revives searing questions about individual guilt for Nazi crimes but also highlights the decades of legal inaction over Auschwitz, where an estimated 1.1 million people were killed. About 6,500 members of the SS worked at the camp; only 49 have been convicted of war crimes. Mr. Gröning first started talking about Auschwitz with associates and his two sons after a fellow collector at his stamp club fiercely denied the Holocaust. His case also illustrates how perceptions of the Holocaust and Nazi crimes have shifted over the decades. In 1945, Lüneburg, then in the British Allied sector of Germany, was the site of one of the first trials of former guards at the Bergen-Belsen and Auschwitz-Birkenau camps. Eleven of those on trial were executed in December of that year. But retribution swiftly gave way to the need to rebuild Germany. The crimes committed at Auschwitz were at the heart of four big trials in Frankfurt in the 1960s. Then, for decades, little happened, as German prosecutors insisted that evidence had to tie those accused of war crimes directly to atrocities. Mr. Gröning’s prosecution became possible only through the trial of John Demjanjuk, a Ukrainian who immigrated to the United States after World War II. He was eventually sentenced in 2011 in Munich to five years in prison for his involvement in the killing of 28,000 Jews at the Sobibor camp in Nazi-occupied Poland. He died in 2012, before his appeal could be heard. For decades before that ruling, prosecutors in Germany had declined to charge anyone with complicity in the Holocaust. One of the people who helped pioneer the shift in German legal thinking was Thomas Walther, a former judge who went to work in 2006 for Germany’s central office for tracking Nazi war crimes, based in Ludwigsburg. Welcome to my Joy of Satan expose page where I will write about this very amusing cult & all of it’s broken ways. Now let’s begin shall we? What is this “Joy of Satan”? Joy of Satan is a “spiritual satanist” organization which believes that satan is the true creator of humanity & that history has been rewritten by jews who are really reptilian space aliens. Their beliefs circle this idea as a rationalization for all their actions. Currently owned and administrated by a woman named “Maxine Dietrich” who says she can speak to directly to satan who is referred to as “father”. As well they see angels as evil energy vampires which pray on people to zap them of all their strength and free will. God or Jehovah is seen as a giant non-existing spinning votex of energy which all the energy from prayers is sent where it can be used by said jews. Jesus Christ is seen as a jewish archetype who never existed & was created from the stories of other gods. They say the jews use him as a way of restraint along with the catholic church to suppress “knowledge”. Satan himself is seen under many names most notably as Enki from sumerian mythos as the creator god. Satan and his demons are seen as the various pagan gods of the past such as Zeus, Isis, and Astaroth who were demonized by said jews. The followers of this see themselves as “gods” and believe that energy centers know as “chakras” are the key to gaining superpowers. Through meditation, they work to empower these in hopes of gaining said superpowers. Her real identity is Andrea Herrington, the wife of the ex-president of the National Socialist Movement Clifford Herrington. She herself is half-native american and a self-hating hypocrite who enforces white supremacist ideals. Old man Herrington in 2002. Fat ugly old man. Andrea Herrington aka Maxine is the trash sitting rows back, slumped in the chair like a dirty repressed POS. The real goal of this cult is to recruit new members for the National Socialist Movement under the geist of a satanic organization. They implant anti-semetic ideas claiming them as satainic with ms. Herrington enforcing this through various psychological brainwashing tactics(see mental conditioning). Much like any other white supremacist neo-nazi organization they want to exterminate all blacks, asians, latinos, and native americans leaving only the white race left. However this satanic cult has currently been revealed to the NSM with Andrea’s husband, Clifford Herrington, being outright fired as president. Now the cult’s only real purpose is donation which support Clifford & Andrea. Joy of satan starts of like any other cult promising happiness & protection while claiming to a false baseless belief system. Anyone with minor occult knowledge can debunk all of the sites beliefs & teaching but this isn’t a factor as it’s to attract rebellious teens & outsiders who know nothing. After initial involvement in the group a “Dedication Ritual” is constantly pushed on them as a pointless contract. This is used as a subconscious trap to implant the idea that they belong as most cults do. Next constant threats are placed upon the members that if they leave bad things will happen to them. Various references to “members” who left are made to incite fear within to keep them in the group. As well the various meditations on the site are mostly stolen & have been altered from their original states. Because of Andrea’s lack of knowledge on the subject her alteration cause mental harm to the people that do them which include but aren’t limited to: oversleeping, hallucinations, and paranoia. Ironically the members constantly argue how free thought is under control by the “enemy” they themselves are not allowed any information that conflicts their thoughts. ms. herrington feeds them bastardized occult information warping their thoughts to conform to her neo-nazi ideology (See “Andrea’s Knowledge”). Anyone who says anything is immediately labeled as a traitor or “enemy of satan” and banned from the group as ms. herrington’s word is law. Any confliction is immediately labeled as “false” or of being corrupted by jews. By this point they are in a very deep state of Ratchet Syndrome where escape is very hard to come by. A very well know claim by joy of satan is that various demons and gods have been know throughout the ages by various different names. This is ludicrous as the names are mixed together without any evidence from various cultures such as how she claims Astaroth (Goetic demon) is also seen as Innana (sumerian), Athena (Greeks), Aset (egyptian), and Anat (ugaritic). A paranoid delusion created in the mind of ms. herrington. Her “Father Satan” is merely a melting pot of other deities from various other cultures since she has no basis on the character of Satan. Because of this she has claimed satan is: Enki, Ea, and Melek Ta’us in order to obtain ground for her claims. These are easily disputed by anyone who searches for 2 mins (actual search time may be less). Her beliefs of satan as ENKI are actually drawn from fictional books written by a man named Zecharia Sitchin who is oddly enough jewish. His theory pertains to a supposed 12th planet called Nibiru that crashed into another planet which was between mars & jupiter called Tiamat. The resulting collision supposedly created earth, the asteroid belt, and comets. Tiamat was supposedly the home of an advanced alien race know as Annunaki who survived and continued to live on earth. On earth the Annunaki supposedly created humans by mixing their genes with homo erectus as a form of slave labor to work in gold mines. Sitchin’s claims have long since been debunked by modern astrologers and genetics but of course provide very entertaining fiction. Also worthy of mention is how ms herrington also takes her name association of satan and other demons from him as Sitchin has claimed that Enki is also ptah and posiedon in the various mythos. The thought of Satan as Melek Ta’us was taken from an inaccuracy in the Satanic bible where it is mentioned as an infernal name of satan(works though). Melek Ta’us in his actuality is an angel of the yezidis. Though many will claim that the yezidis are devil worshipers they are quite the opposite as they worship angels. The yezidis are a sect of the religion of Yazdanism which itself derives from the Kurdish word Yazdân, meaning God or angel. Melek Ta’us himself is an illumination of god created before humans and a servant of said god. He is god’s representative between him and humanity NOT an evil entity. Ms. herrington took this her association in order to have the black book of the yezidis to ground her claims but ofcourse her site isn’t for the enlightened. At the end this was all done as a cheap attempt to make her satan seem older than judiasm but as you can see above there is no real ground for this butchered mess. There is no real Father Satan. Who is the Real Satan? The real Satan in actuality has his origins in Jewish mythology. He is in all truth the angel of death Sammuel with his god given title being Ea-Satan or the adversary. His job on earth is to tempt humanity to sin, to disobey, to be wicked. Throughout his temptations the hearts of those that resist become stronger because of it as is his job. He isn’t really evil but acts like it because it’s his angelic function. Within the old testament the only reference made to him is during the book of Job where the faith of Job is tested by Sammuel through a series of tragedies. In behind closed doors however he was more of an agnostic with sympathies toward christianity but never denied them. He had no satanic or occult connections, he even ridiculed ideas of occult & neo-paganism behind closed doors. All of ms. herrington’s “satanic hitler” claims have no evidence to support them and only show her incompetence. Jews stole everything, jews have all the power, jews have all the money, and anything that can be said negatively about the jews. This is all andrea’s knowledge amounts to and anything added is automaticly taken out of context or from new age sources which are bastardized enough as it is. 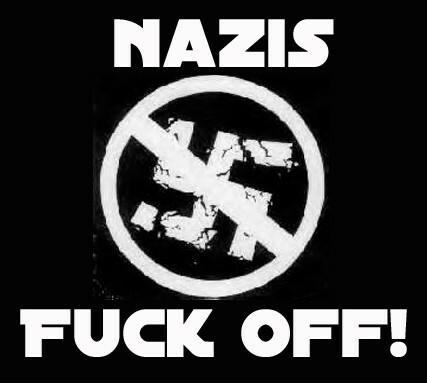 Along with this neo-nazi ideology is unconsciously fed into them with her already highly damaging “knowledge”. This preps them for joining NSM or would if they weren’t expelled for being “Satanic”. Satan’s powers A site created by a former high priest of JOS which shows the inner working of the organization.